H. Rick Bamman - hbamman@shawmedia.com After seeing her children off to school Kathy Mor (cq) checks the sprouts in the hoop house on the Green Earth Farm in Richmond. The 10 acre farm participates in community supported agriculture, a movement where people pay for a periodic share of the produce grown on the farm. 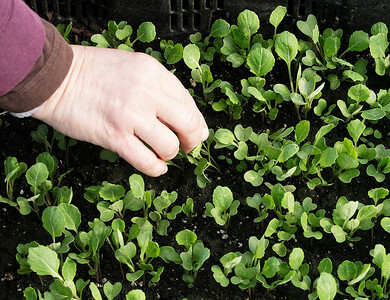 H. Rick Bamman - hbamman@shawmedia.com Green Earth Farm's Kathy Mor (cq) checks on the young crop of brussel sprouts on the10 acre farm in Richmond. The crops are grown organically, using sustainable farming practices. The seeds are from heirloom varieties that have been passed down through the generations. 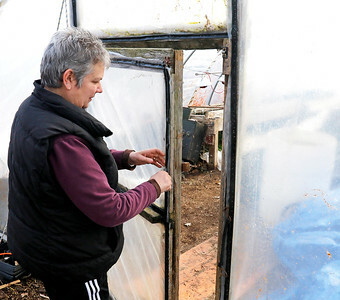 H. Rick Bamman - hbamman@shawmedia.com Kathy Mor (cq) of the Green Earth Farm in Richmond checks brussel sprouts plants in one of the hoop house on the 10 acre farm in Richmond. 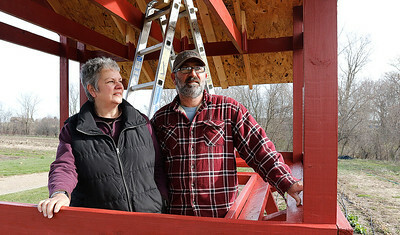 H. Rick Bamman - hbamman@shawmedia.com Kathy and Scott Mor (cq) are constructing a new farm stand at the Green Earth Farm along Barnard Mill Rd in Richmond. The 10 acre farm, produces over 100 varieties of vegetables, herbs and fruits grown organically using sustainable farming practices. 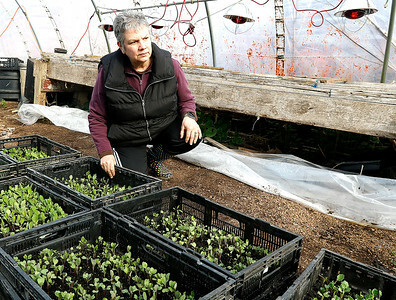 Green Earth Farm's Kathy Mor (cq) checks on the young crop of brussel sprouts on the10 acre farm in Richmond. The crops are grown organically, using sustainable farming practices. The seeds are from heirloom varieties that have been passed down through the generations.